Plus-size ladies of Toronto rejoice! My dear friend, Karen of Curvy Canadian has opened her very own store here in Toronto and she has invited us to celebrate the grand opening this Saturday, January 12th from 1pm to 5pm. 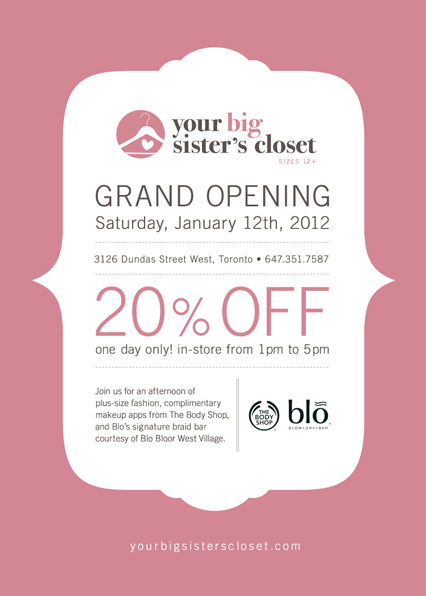 Not only will she be hosting her first sale 20% off during the party, but there will also be complimentary makeup apps from The Body Shop, and a braid bar courtesy of Blo Bloor West Village (HELLO flawless hair). Rumour has it there will even be a macaron tower and light refreshments! yumm. Hope to see some of you there! I'll be sure to share pics.